Illicium mexicanum is a small aromatic, evergreen tree native to Mexico. It is an attractive plant with dark green foliage and red flowers. Blooming Time: Spring. It will also bloom sporadically throughout the summer and lightly again in the fall. Culture: Illicium mexicanum need partial shade and a rich well drained soil. We use a mix of 2 parts peat moss to 2 parts sand to 1 part loam. Keep the plant evenly moist throughout the growing season. For optimum growth fertilize weekly with a balanced fertilizer diluted to ½ the strength recommended on the label. Temperatures should be kept above 50 degrees during the winter months. Propagation: Illicium mexicanum are readily propagated by seed or by layers taken in spring or by cuttings of half-ripe wood in August. 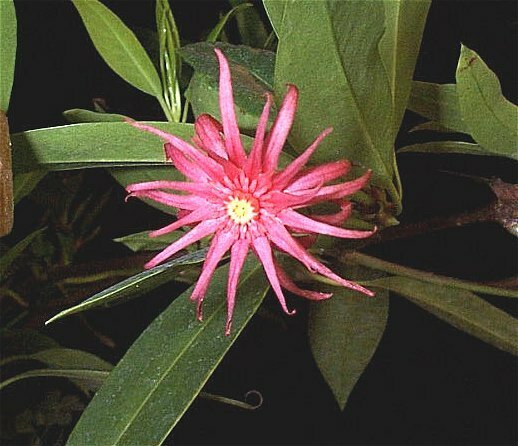 Illicium mexicanum was featured as Plant of the Week July 21-27, 2000.